Drum&BassArena has been deep in the D&B game since 1996 and has been documenting, celebrating, supporting and developing the genre now for 18 years - from parties to podcasts and articles to albums. 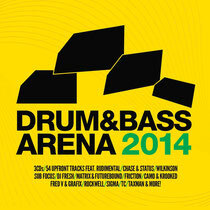 Albums which include this, the latest annual self-titled spring collection ‘Drum&BassArena 2014’. The brand’s 24th full length album is their biggest spring collection to date: 54 tracks from some of the most influential and creative artists in D&B over three CDs, including seven exclusives, it delves deep into every corner of the genre to create an all-encompassing, authoritative D&B narrative that shows the scene at the broadest, boldest and healthiest. Submissions come from hyped new artists such as the Zane Lowe-endorsed Rollz and Hospital’s ‘Etherwood’ to household names in D&B such as Wilkinson, DJ Fresh, Chase & Status, Rudimental and Matrix & Futurebound via respected artists such as Dom & Roland, Calibre, Break, Audio and Rockwell. Complete with seven exclusives from Mampi Swift, Rollz, Serum, BTK and more, it’s out Sunday 6 April (Digital) and Monday 7 April (3CD) on Drum&BassArena.